Dr. Justin grew up in the chiropractic culture as his mother took him to get adjusted since he was an infant. In high school, he hurt his ankle while playing basketball and was told he’d be out for the rest of the season. X-rays revealed that the ankle wasn’t broken so he went to see his chiropractor who adjusted it. Within 2-3 days, Dr. Justin returned to practice. His positive experience, coupled with a desire to work in the healthcare field, solidified his desire to become a chiropractor. To earn his Doctor of Chiropractic, Dr. Justin studied at Northwestern Health Sciences University in the Twin Cities. In addition to the robust curriculum, he learned so much from the doctors who donated their time to teach above and beyond what they shared in the classroom. “For me, that was huge and instilled the importance of continuing education.” Dr. Justin has many tools in his toolbox including extra schooling in Torque Release Technique, Applied Kinesiology and nutrition. 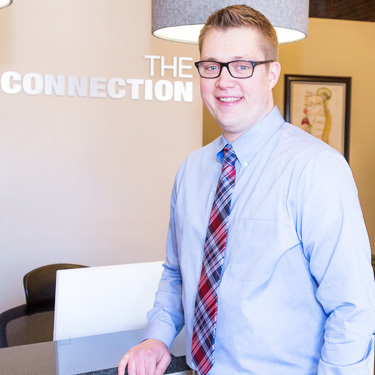 At The Connection a chiropractic place, Dr. Justin enjoys caring for patients across the spectrum, particularly families. As a father, he is particularly passionate about helping children get off to the healthiest start in life with chiropractic care. From helping a colicky baby who hasn’t slept for two weeks start sleeping through the night to providing wellness care to adults, chiropractic can benefit those of every age and stage. Dr. Justin uses a variety of adjusting techniques and will put together a combination that’s right for each patient. For Dr. Justin, seeing people come into the practice who have little hope experience a turnaround in their health is fulfilling. “My goal is to empower patients to realize that they have the ability to heal.” He likes to see those committed to wellness continue with regular care. “Taking the initiative to be proactive with your health versus waiting for things to fall apart is vital.” He is well versed in many techniques include Gonstead, Chiropractic BioPhysics® and many more. Discover healing in our high-energy chiropractic office where we’re on fire about chiropractic and helping patients experience optimal health. Contact us today to book an appointment with Dr. Justin!